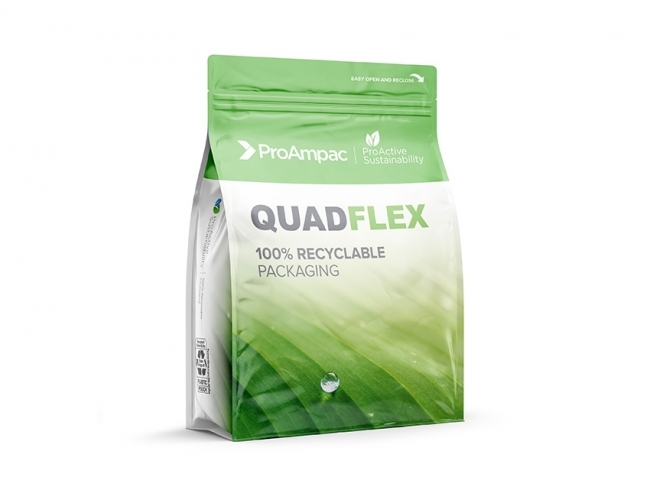 CINCINNATI, June12, 2018 – ProAmpac, a pioneer in sustainable flexible packaging, announces the launch of the No.2 QuadFlex pouch, its newest member to their fully recyclable No. 2 Pouch® platform. This premium flexible packaging solution provides a sustainable consumer packaging option for companies wanting recyclability without sacrificing high quality graphics which deliver a superior shelf presence. Since the introduction of the No. 2 stand-up pouch in 2011, the first pouch to receive How2Recycle approval, ProAmpac has been on the forefront of sustainable flexible packaging. The No.2 QuadFlex pouch is a quad-seal, flat-bottom structure delivering exceptional shelf stability while providing five panels of branding billboard space in a design with four corner seals providing enhanced shelf appeal. “We listened to our customers. Brand owners across multiple markets challenged ProAmpac, making it clear that a recyclable quad-seal style pouch was needed across all our markets. From pet food to lawn and garden, cereal and salty snacks, we believe this new pouch will be a game changer in sustainable packaging options for our customers,” says Julie Conklin, Senior Product Market Manager. ProAmpac delivers premium packaging innovation to customers, while also increasing their green product portfolio, a trend that will continue to grow as demand for sustainable packaging grows. ProAmpac is ready to supply customers immediately. The new pouch, which is available in small to large sizes for multiple market applications, can also include optional oxygen barrier properties if required. This new design will be launched by a leading organic lawn and garden brand in the coming months. The No.2 QuadFlex pouch is the result of an intensive research and development initiative that overcame processing challenges inherent to the premium quad-seal pouch structure. It is the second member of ProAmpac’s recyclable No.2 pouch platform. The ProAmpac No.2 standup pouch, introduced in 2011, was the first primary flexible package to participate in the How2Recycle program. It was awarded a Gold Flexible Packaging Award from the Flexible Packaging Association for Environmental & Sustainability Achievement in 2013. The How2Recycle program provides consumers a path to recycling flexible packaging. ProAmpac’s No.2 Pouch is a fully recyclable high-density polyethylene (HDPE) blend in the No. 2 HDPE+ recycle stream. The How2Recycle logo is placed on commercial pouches with instructions to consumers on how to recycle their packaging. Labels inform consumers the product is classified as a plastic bag and, if clean and dry, may be recycled through store drop off. With 33 facilities, 4,000 employees and more than 5,000 customers worldwide, ProAmpac is recognized as one of the nation’s top 10 packaging converters. For further product information click here or email marketing@proampac.com or call 800.543.7030.